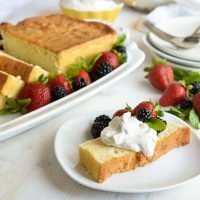 Make this Amaretto Pound Cake Recipe with Whipped Crème Fraîche for a simple and indulgent dessert. 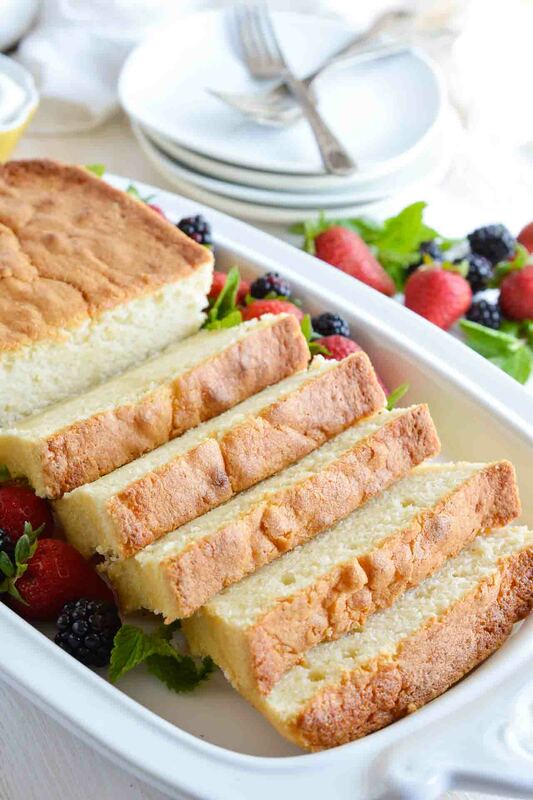 This easy homemade cake is flavored with almond and amaretto then baked in a loaf pan. 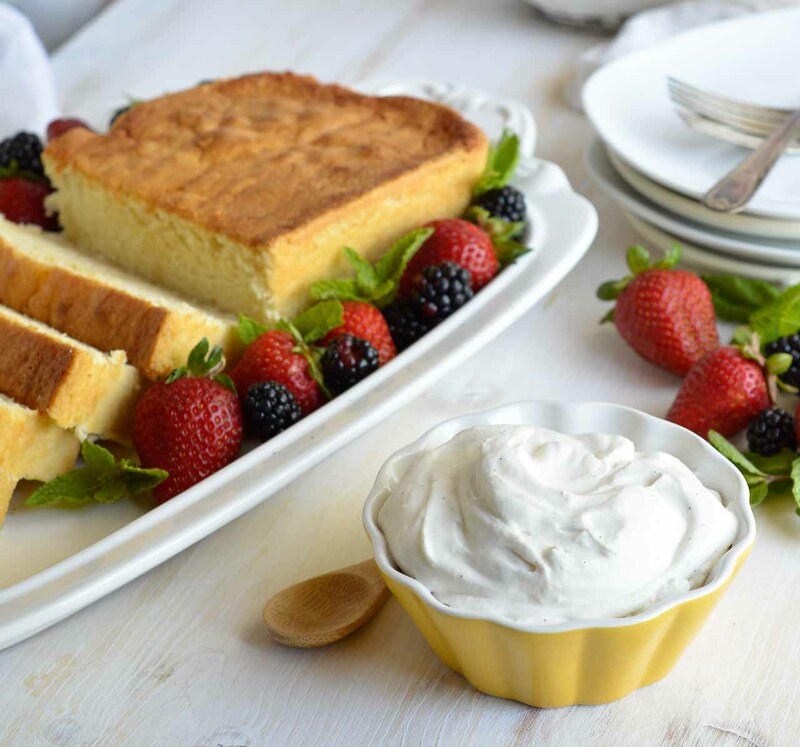 Serve with fluffy whipped vanilla crème fraîche and fresh berries for a gorgeous sweet treat! Baking a cake from scratch doesn’t have to be an overcomplicated ordeal. Yeah, yeah. Perfectly frosted layer cakes are amazing and beautiful. But, ain’t nobody got time for that! Save those time consuming cakes for birthdays or extra special occasions. 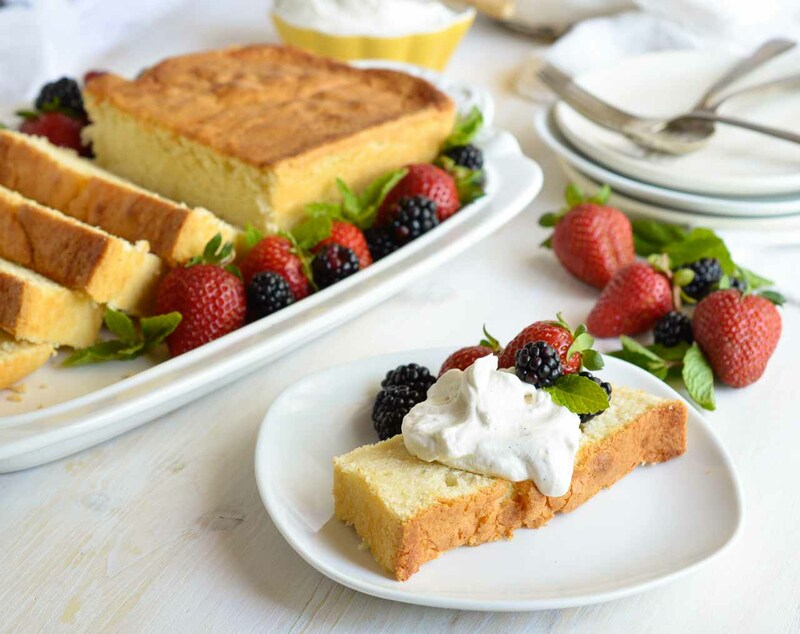 This Amaretto Pound Cake Recipe with Whipped Crème Fraîche is perfect for every occasion . . . or no occasion at all. I call this the Bake and Slice cake. It is easy to whip up and can be served with anything or plain. This crème fraîche topping is 3 ingredients and takes less time to make than whipped cream. And, it is the perfect size for feeding a family. Who needs a week’s worth of leftover cake!?!? I certainly Do Not. This recipe is adapted from Ina Garten’s Perfect Pound Cake Recipe. I own the Barefoot Contessa Foolproof Cookbook and I highly recommend it. And yes, the recipe does not use baking powder. It does however include cake flour. So the end result is a fabulously dense pound cake. 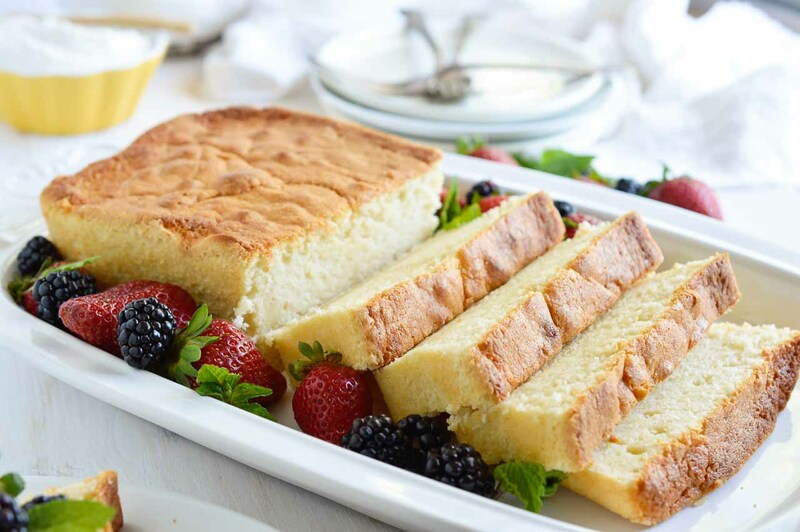 For this cake you will need: Loaf Pan, Rodelle Almond Extract and Rodelle Vanilla Bean Paste. Beat butter and sugar for 3 minutes. Mix in eggs, sour cream and almond extract. Gradually mix in dry ingredients while alternately adding amaretto. Mix until combined. Transfer batter to standard loaf pan that has been generously sprayed with nonstick. Bake on center rack for 50-55 minutes or until toothpick can be inserted and removed clean. Allow to cool in pan for 30 minutes then transfer to cooling rack. Combine ingredients and whip for 1 minute. Regular whipped cream can be used instead of crème fraîche.